Published together with our partner, Fortune, the Best Workplaces in Consulting & Professional Services rankings are based on feedback from more than 36,750 employees at Great Place to WorkCertified organizations in the consulting or professional services sectors. Employees completed our anonymous Trust Index© survey, answering questions about how frequently they experience the building blocks of a great workplace. Employees rate leadership strength, benefit quality, opportunities for professional growth and support for work-life balance among other factors. Results from the survey are highly reliable, having a 95 percent confidence level and a margin of error of 5 percent or less. 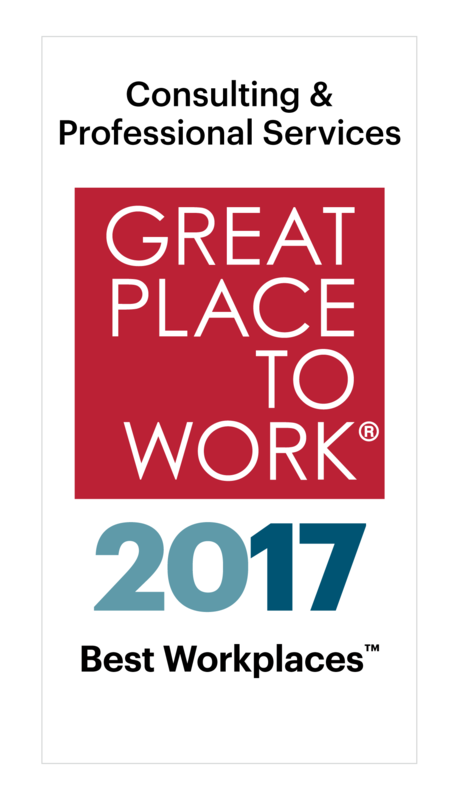 Earning a place on this list indicates the company has distinguished itself from peers by creating a Great Place to Work For All. Rankings reward organizations where not only the majority of their employees experience a great place to work, but these experiences are highly consistent regardless of who people are or what they do within the organization. Results are considered based on the complexity of the employee population and relative to peer performance. Employees who agree that people care about each other here are more than 6 times more likely to want to stay at their organization a long time.